Yesterday we celebrated Maddie’s two week birthday, but I was the one who got the present. We have a routine down for our NICU life. 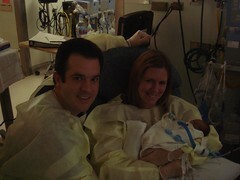 We wake up every morning at 6:30 am and call the NICU to speak with the nurse that watched Maddie for the night. After we get the report of how her night went, we have breakfast. Mike usually heads over to the hospital after that to talk to her doctors and meet her day nurse, while I stay at home to pump (I have to freeze the milk for her to eat later) and rest. I usually join Mike after lunch, and I spend some time at Maddie’s bed talking to her and touching her. We usually stay at the hospital until 4:30, then we head home to rest and have dinner. We go back to the hospital at 8 pm to meet her night nurse and say goodnight to her. Yesterday started like any other day. Mike went to the hospital early, and my mom and I joined him there a bit later than usual, around 2 pm. My mom and I went back to see Maddie and we chatted with her nurse about all the progress she’s made. Since her rough patch last week, Maddie has made another big turn around. Just to list quickly: she had all three of her chest tubes removed, had her catheter taken out, is on an extremely low dose of pain medicine, is off the nitrix, her ventilator is almost to the point where it can be removed, and she is almost off her blood pressure medicine (I’ll explain all these things later). After the three of us had talked a bit, the nurse said, “You’ve never held her, right? Do you want to?” Uh, duh Nurse Obvious! Of COURSE I want to hold her! I didn’t have a baby just to look at it. She’s more than just a paper weight! I almost cried I was so happy, and I wasn’t even holding her yet. My mom went outside the NICU to get Mike and a camera. Just the simple act of getting Maddie out of bed was a big deal. She’s got an IV line in each arm and in her foot, three electric leads monitoring her heart rate, another lead measuring her blood oxygen level, a blood pressure cuff on her other leg, and her respirator. 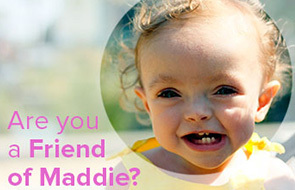 The nurse needed a respiratory therapist to help her get Maddie disconnected and then reconnected to everything. I sat down in a rocking chair with a pillow on my lap, and waited for Maddie to be handed to me. When I finally had her in my arms, I couldn’t help it, I cried. I’d waited so long to hold her! It was a long 29 weeks of pregnancy and an even longer two weeks since she’d been born. But to have her stable enough to hold her was the best part. Mike took a million pictures during the hour I cuddled her. She really is the tiniest thing, she looks big when she’s in her bed, but she weighed almost nothing in my arms. I didn’t want the hour to end! She looooved being held. All her vital stats were way up and she wiggled around and opened her eyes to gaze at Mike and me. It was the best day of my life. AWESOME…I really enjoyed the pictures. I can’t help it – I cried just READING that!!!! She’s looking great, and I can’t wait to officially meet her. No more talking to her through your abdomen! So happy everything is going okay. She’s beautiful! okay, now I’m crying;). I’m so that it continues to get better and better!